Announcement Thank you for stopping by! This is THE best place to find unique and one of a kind handmade cards and embellishments for your scrapbook, card making, and other creative projects. All are made by hand totally one of a kind. Thank you for stopping by! This is THE best place to find unique and one of a kind handmade cards and embellishments for your scrapbook, card making, and other creative projects. All are made by hand totally one of a kind. 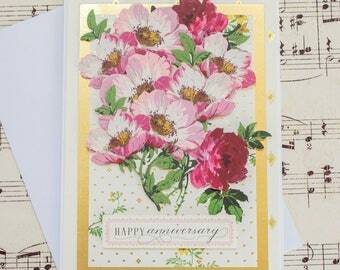 Recipients are always happy when I send cards by her. lovely as is everything from her. This one is one of my favorites. I think I am going to frame it for myself. 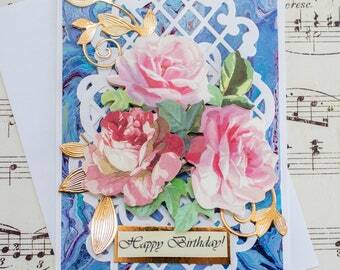 Beautiful and elaborate card, my friend will love it. Thank you for the extra card, too. How thoughtful of you! Your friend's birthday is coming up! 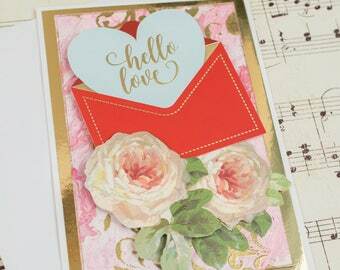 Send her a card that's as special as she is!!! Absolutely loving the new cards that I listed in the shop today! 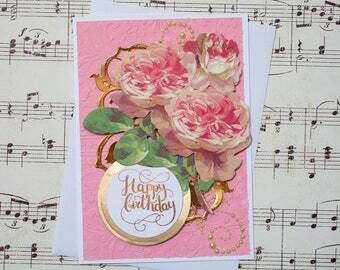 Give Mom a card as beautiful and unique as she is! I am a daughter, sister, mother of two, grandmother of two, artist, crafter, creator, and dreamer. I've been crafting for well over 30 years now. I've been creating stuff for the past 30+ years! I've knitted and crocheted, sewed, made homemade candies, beaded, dabbled in painting. My current obsession is scrapbooking, cardmaking, and making embellishments for cards and scrapbooks! I am really happy that my daughter introduced me to etsy. I can't believe what a wonderful site and community it is. My current obsession is scrapbooking, cardmaking, and making embellishments for cards and scrapbooks! I am really happy that my daughter introducded me to etsy. I can't believe what a wonderful site and community it is. I've been playing with cameras since high school, but it wasn't until I began painting that really inspired me to take photography seriously. Someone suggested I take my own photos to use as inspiration/reference when I paint. A love affair was born! Thanks for stopping by! This is THE best place to find unique handmade cards and embellishments for your scrapbook, card making, and other creative projects. All are made by hand and no two pieces are alike! Payment is expected at the time of checkout. Please see this link https://www.etsy.com/help/article/339?ref=help_search_result if you have any issues with checking out; it will walk you through the process. I ship to the address on your Etsy receipt. Please make sure that this is correct address. If you need me to ship your purchase to another destination, please leave me a message, or contact me to let me know. I am more than happy to ship to your recipient. Cards are shipped flat in a padded envelope. I ship everything via USPS First Class. Please contact me if you'd like Delivery Confirmation or Insurance options. I want you to be completely happy with your purchase. Please do not hesitate to contact me if you are unhappy with the quality of your purchase; I will either replace or exchange it. If you have any questions or comments, please send me a convo!